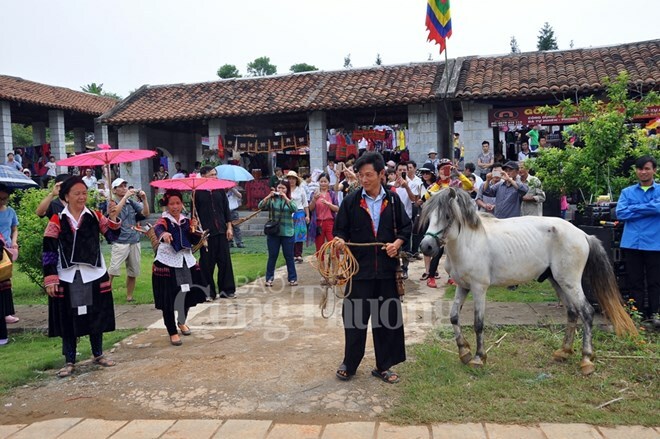 Hanoi (VNA) – Activities themed around the “Colours of Vietnamese ethnic groups” will take place at the Vietnam National Village for Ethnic Culture and Tourism from April 1 to May 2, to celebrate Vietnam’s Ethnic Groups’ Cultural Day (April 19). One of the event’s highlights will be a highlands market introducing the traditional specialties and folk games of the Mong, Dao, Thai, Muong, Kho Mu, Tay, Ha Nhi, and Si La ethnic groups. Artists from the northern mountainous provinces of Lai Chau and Son La will stage folk song performances, while about 40 photos themed “Colours of Northwest Culture” will be on display. The Pang A festival of the La Ha ethnic group in Son La province, the rainy season festival of the Ha Nhi ethnic group in Lai Chau, and the new crop festival of the Si La group will be also revived. The Vietnam Ethnic Groups’ Cultural Day will be held from April 19-21, with village leaders and prestigious members of ethnic communities taking part.